When we hear the word ‘opium,’ one of the nouns that first appear on our mind is most likely ‘addiction.’ This is apparently what YSL want to showcase when the company first introduced YSL Opium into the market some time ago. As a perfume, YSL Opium has been named so because of its captivating smell. The scent will please anybody, gradually enchanting them, making them longing for more and more. So, there is no need to wonder why YSL Opium still remains as an extremely popular perfume, even after decades of the initial release. YSL Opium is the secret weapon for any woman who wants to appear seductive and addictive. YSL Opium is produced by Yves Saint Laurent YSL, which is also known as Saint Laurent Paris and often abbreviated simply as YSL, a French luxury fashion house that is generally considered as one of the world’s most prominent fashion houses. YSL is well-known for their modern and iconic products – their tuxedo jackets for women make great examples. Besides producing fashion products, they also make premium leather goods, jewelry, and, of course, perfumes. First released in 1977, YSL Opium was crafted by Jean Amic and Jean-Louis Sieuzac. However, in 2009, the manufacturer has re-launched YSL Opium in a new flacon, along with a lot of advertising campaigns. The new flacon was designed by the company’s art director, Fabien Baron, and Stefano Pilati. For decades, YSL Opium has been greatly loved by women all around the world, and the re-release has allowed the new generations to meet this phenomenal fragrance. In general, people consider YSL Opium as an original spicy oriental fragrance. YSL Opium is delivered in a stylish elegant red box. There are decorative figures of leaves colored in a pale golden color on the box, giving you an impression as if the box is coming from some Asian land. At the center of the front side, the name Opium is written in the same color. Well, some of us may joke that such design can cause awkward situations if you are taking this perfume abroad – the security officers are likely to question: “Are you bringing opium with you?” Inside the box, you can find a rectangular red bottle that features an integrated sprinkle inside the stopper. YSL Opium is best described as a rich, exotic oriental scent. It is warm and spicy, with such depth that will make people who smell this scent intrigued to find out more about what’s hidden behind. The mysterious, enchanting sweetness will attract people to enjoy the scent more and more. The perfume opens with the fresh, slightly citrusy top notes of bergamot and mandarin orange. However, the presence of the exotic ingredients of myrrh, carnation, and opoponax quickly comes into play. The combination creates a pleasant, welcoming spiciness. Various floral notes, most notably jasmine and lily, further enhance the overall scent, whereas amber, patchouli, and vanilla notes serve as a solid base. Another great thing about YSL Opium is its superb longevity. It is extremely long lasting that you can wear it in the morning and still smelling as fresh towards the evening. You hardly need to re-apply the scent to progress further through the day. In addition, the sillage is also quite heavy. It projects very well. – Extremely long lasting, able to last for the whole day! 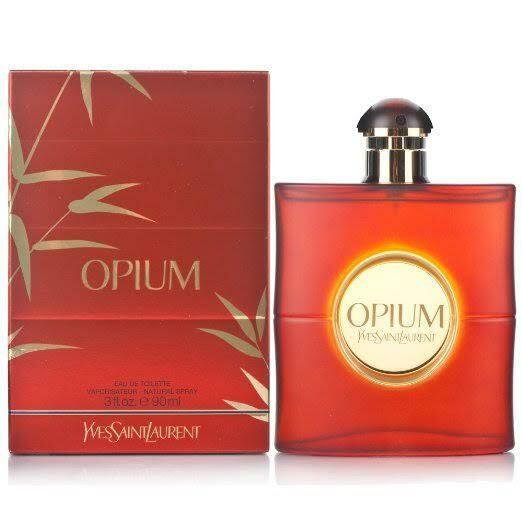 Check the best price for YSL Opium here!